Nails Inc Half Moon Street and $OPI Absinthe Makes the Heart: My Nails are Nubbins! That NOTD was $OPI Absinthe Makes the Heart. That one I love. I don't normally like greens, because I'm a colour wimp, but I LOVE this one. It's a greyish green - or a greenish grey - with super cool foil effect, and a good amount of glitter. I really love how it looks, and I think it would look cool with a matte topcoat over it too. Somehow, my skintone seems to draw out the extreme colour possibilities in it - on me, sometimes it even looks positively emerald green, while other times it looks like a metallic gunmetal grey. I really like this one. It's like, deep, jewelled green with tons of grey. Cool. It applied a little sheer, so this is 3 coats. 2 would have covered most areas, but I wanted to cover everything. Anyway, back to the sad state of my travel-worn nubbins. They're all short and uneven now. I'm hoping they'll grow out soon. It just makes me want to cry, because that was 3.5 weeks of growing out my nails down the drain (yes, my nails grow slower than snails move, and they break and peel, so that was my record length so far). If only there was a way to travel that wouldn't ruin my nails...I'd love travelling so much more. But since I'm all stuck with short nails for however long they take to grow out, I'm going to wear all the bold and vampy colours I can while the nubbins last. So, you know, the next few NOTDs are going to be bold and dark! No more nudes! 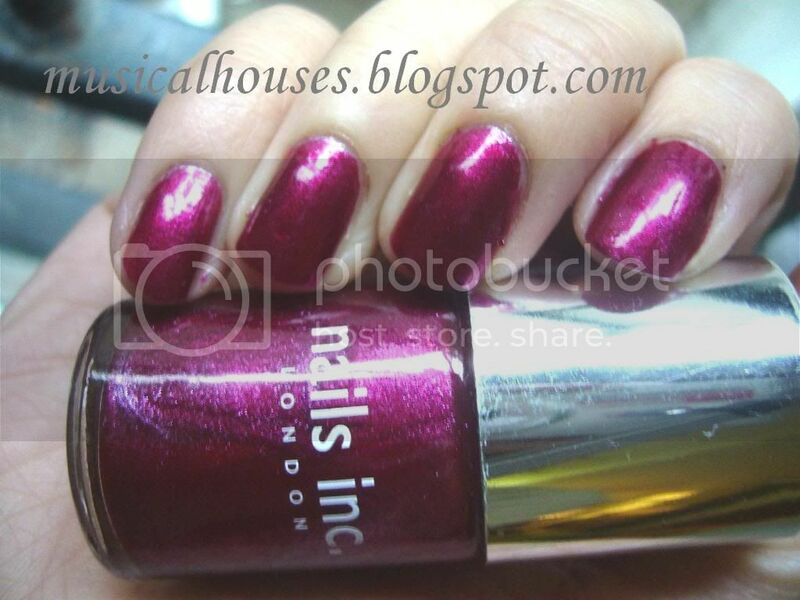 So for now, my mani is Nails Inc Half Moon Street. This is an exclusive I believe, but I cant remember what exactly it was exclusive to. I believe it was one of those "Wow-you've-spent-so-much-money-on-our-stuff-so-here's-a-little-something-for-you" free gifts they give you if you place a big order on their website, which would absolutely explain how and why I have it. Its also very beautiful. 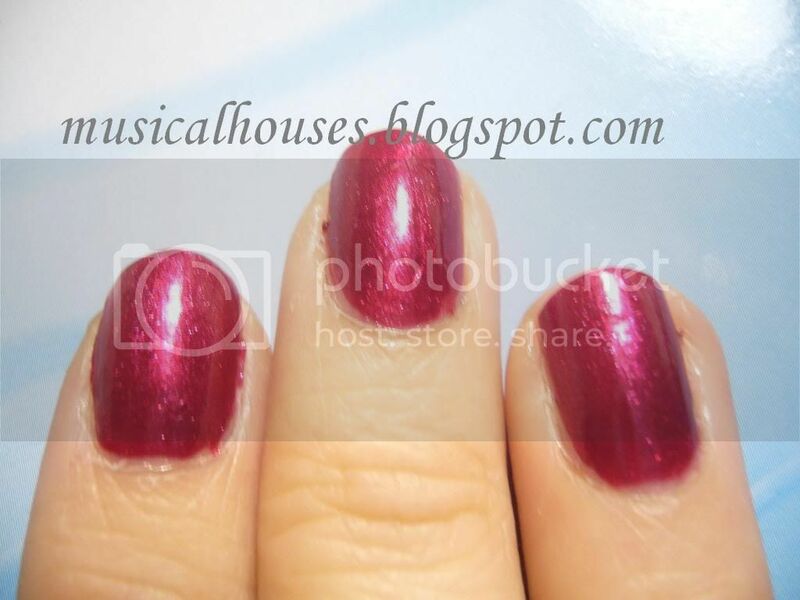 It's a glowy magenta-pinky-red type of colour, with a lit-from within look, and a finish that defies description. I'd call it a shimmer with a metallic leaning. It has superfine silver shimmer that shows up as a sort of metallic glow. Very lovely. I don't really like bright pinks in general, but this one really has me staring at it all day long. Application, as is usual for Nails Inc, was a dream. This one was very pigmented and smooth. I did two coats, although if I had better skills I could have gotten away with one coat. Love this one. And because I do so love this colour, here is a close-up shot of my nails. Take a look at the glowy goodness emanating from this thing! I'm really starting to like Nails Inc a lot. With the exception of Elizabeth Street which was a dud (and I'm thinking it may be a dud because it was the free polish that came with Glamour Mag, and maybe they cut corners for the freebie), every Nails Inc polish I've tried has been nothing short of fabulous. The only thing is, most of their interesting colours tend to be exclusives, leaving the permanent line of colours a little dull. They've only just started coming out with mattes, months after all the big players have made their moves, and they've yet to come out with a duochrome, a flakie, or a holo. Awww come on, Nails Inc, I'm tired of waiting already! And since we're hurrying the world along, while we're at it, let's tell my nubbins to hurry up and grow out! I'm waiting! And my polish stash is waiting! I love that nail length on you! I wish we had Nails Inc in the US, I love their colors! And their application is a dream as well. I love the color and your nubbins are very pretty. Just look at it this way, you can go ahead and start shaping your nails now and when they grow out you'll have beautifully shaped long nails. Oooooooooooooohhh. 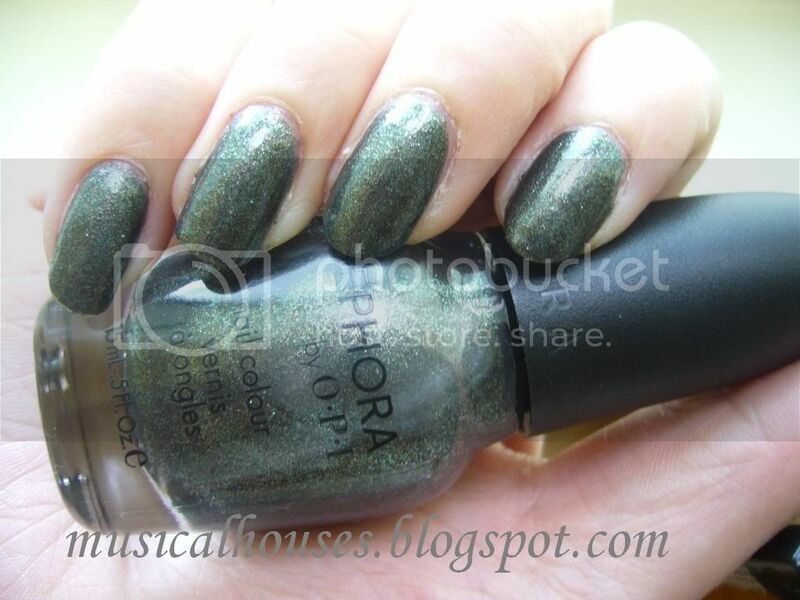 I like that Sephora OIP color1 I only wish it wasn't so darn expensive. I think your nail length looks pretty. I have no idea what you are talking about. Wow, Absinthe Makes the Heart is insanely gorgeous. I think I need that one! So sorry to hear about your nails! I hate when that happens too! I've kind of given up and am keeping mine about 1-2mm off the nail bed now though since it's just more practical for the amount of typing I do and my poor right index and rings always get so split/peeled. But do try to increase your calcium intake!! Weak peeling nails are often a sign of calcium deficiency (which is really bad, especially for our demographic b/c of high risk of osteoporosis!!) and taking more calcium can really help your nails! Taking biotin will help them grow faster too... but I've heard that with biotin it basically makes all your fibrous proteins grow faster, including all kinds of hair on your body so... kind of a mixed bag there lol. I find it so hard to apply dark colour without getting it all over my fingers. But the catch is I love darks and bolds. The green/gunmetal shade indeed looks very unique! 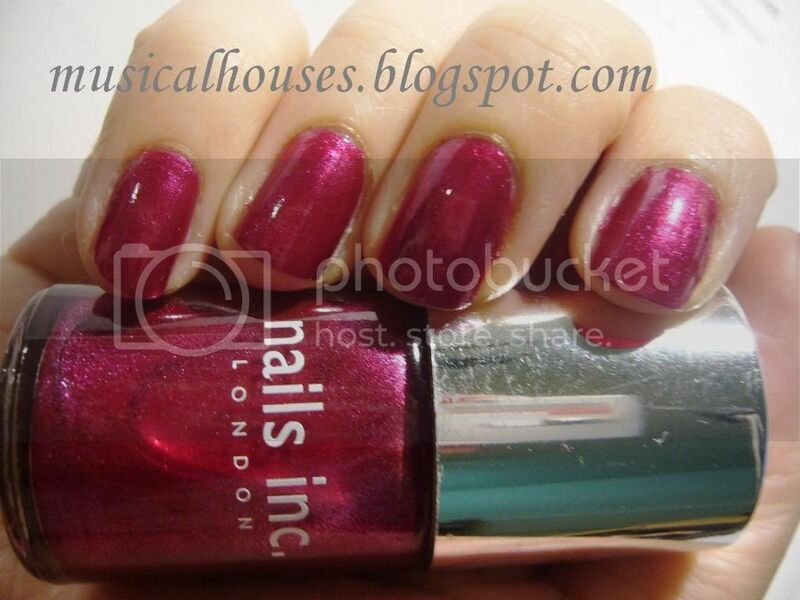 It's a shame they don't have nails.inc where I live (canada) but my recent loves are the gosh line, which i believe originated from uk/london? Oh man thats so cool. Had no idea Gosh was danish. And duh I totally misread and thought the green was from nails.inc. We actually have sephora here so i may just have to go down and check out that colour myself!